The book concerns itself with a family of missionaries, parents and four daughters, who go to the Congo in the late 50s, early 60s. Having lived through the tale end of that period I cannot imagine why anyone with even a single brain cell would choose to take small children there with what was occurring. The father is an obsessive fire and brimstone preacher with no respect for Africa, Africans, or his family. We can all guess that this is not going to have a completely happy ending. First, the good, the author’s voice, the setting details that give an excellent sense of place, the well developed characters in the mother and daughters (even when you want to slap them), and the fact that it does not come across as religously preachy at all in the reading. I would say I enjoyed the first 400 pages and would have been happy to have the book end there. There had been some hints as to what was to come, but they were not overdone in those 400 pages, so I was okay with that. How bad Christians are for sending missionaries. Ehh I could take that one or leave it. How evil America and Belguim and various other European countries are and how their foreign policies cause all the problems in Africa. I’m am well aware that grievous errors were made especially in the Congo at that time, but I don’t think you can lay all blame at America’s feet. How communism will be the saving grace of Africa. Yeah, because corruption is never a problem with communism in practice. How all morality is relative. umm, just no. How Americans should feel shame, in fact all white people should be ashamed, in fact we should feel shamed for having a choice of toothpaste in the grocery store. Sorry, don’t really find shame productive in any sense of the word. How marriage is oppressive. Perhaps for one of the clearly most passive female characters I’ve ever read it was, but not for everyone. How all cultural norms are equally worthy. Ummm, let’s think, female genital mutilation anyone? How many ways can we idolize the “noble savage”. I find that stereotype offensive. There is more, but it just irritated me beyond belief. I can’t stand reading novels that turn into a soapbox for an author’s political ideals/agenda, even when cloaked in a character’s voice. Case Histories by Kate Atkinson was in contrast to above, an excellent, engaging read, this is one of those books termed a “literary mystery”. The story centers around cold cases involving young women/children and the private investigator, Jackson Brodie, who finds himself wrapped up in them. One was a young child, from a highly dysfunctional family who disappeared during the night from a tent in the backyard. Another was a teen murdered in her father’s office, with the culprit never caught. The third was a child who disappeared while her mother was imprisoned. The writing here was first class and totally absorbing. The writer pulls you into each of the stories with her very intimate style. My favorite storyline was Theo’s, the father whose child was murdered in his office. His story alone made the book worthwhile. Mystery and literary fiction fans would both enjoy this novel. That is a fine review. I see I have not been wrong to push this title to the bottom of my list for years. 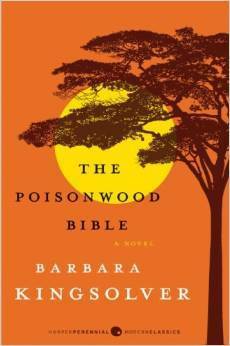 So many people would go on about it, looking at me doe-eyed, “Oh, you have read The Poisonwood Bible?” and wanting to then loan me their copy.